Twitter activities use OAuth protocol for authentication. OAuth is a simple way to publish and interact with protected data, more info here http://oauth.net and http://dev.twitter.com/pages/auth . 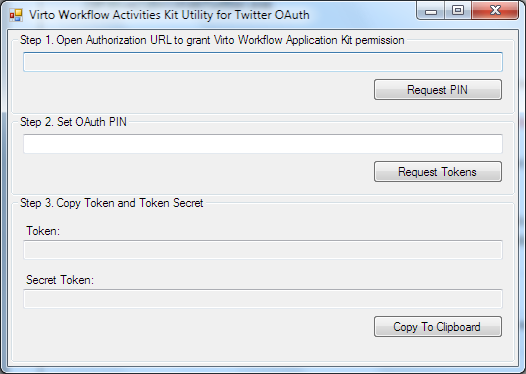 Virto Workflow Activities Kit is registered Twitter application. 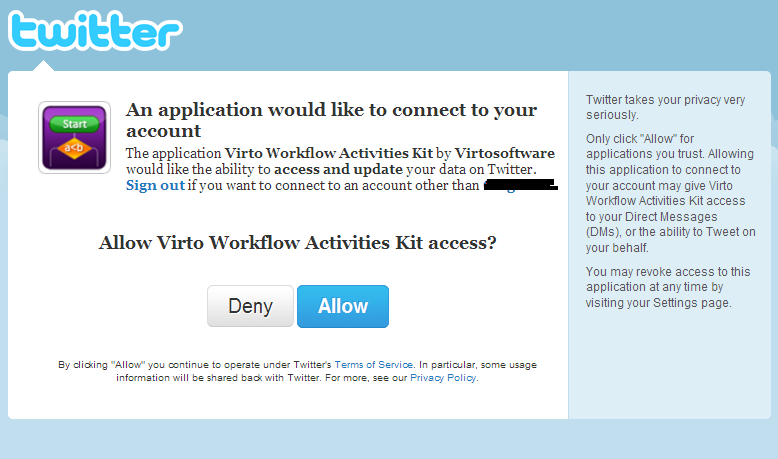 You should grant permissions for Virto Workflow Activities Kit application before using Twitter activities. You should use Virto Workflow Activities Kit Utility for Twitter (WakTwitter.exe) to allow Virto Workflow Activities Kit application to connect to your account and get token and security token. Virto Workflow Activities Kit installation adds WakTwitter.exe into [SP Hive]\Bin folder. Step 1. Run WakTwitter.exe application from Virto Workflow Activities Kit. WakTwitter application requests token from Twitter site and open browser page with request page. You should allow Virto Workflow Activities Kit application to connect to your account. You may revoke access to this application at any time by visiting your Settings page. Simply return to WakTwitter, enter the following PIN and click “Request Tokens” button to complete the process. Keep Token and Secuity Token. You should use them in “Set Twitter OAuth authentication” activity.